This menstrual cup has a lot in common with the most popular menstrual cups. It is made of medical-grade, dye free silicone and comes in two sizes (pre- and post- childbirth). It offers an easy to use, ecologically friendly alternative to tampons or pads. Since it costs only as much as 6 months of pads or tampons but lasts for 10 years, you can save a lot of money switching to the angelcup. It also has a unique stem design. 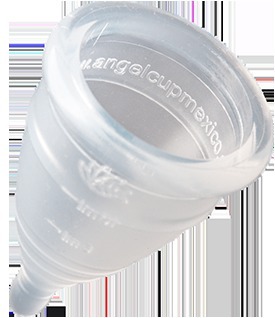 Unlike other menstrual cups, which may have stems that are large and ridged, which many women find uncomfortable and requires trimming, the angelcup has a round, egg shaped stem that should be both easy to use and comfortable to wear. Though it is produced outside the US, it does carry FDA approval for being safe to use.